Your uncle Cliff’s Chia pet. 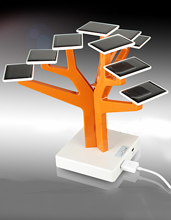 Presenting the USB Solar Charger Tree, basically a plastic tree with solar-panel leaves for powering most mobile devices, available now. We admit: this thing is a little ridiculous. But at the end of the day, it’s good for the environment and it charges your phone. Two wins. Also, it looks like a happy desktop tree (unlike the one that keeps dying in your office). Another win. Once that’s done, you’ll have a phone that can get charged up with a solar-powered tree. And if it happens to be a sunless day (or, you know, nighttime), you can also connect the AC adapter to give the battery a jump start. Note: watering this thing won’t help matters.